Most people have headaches once in a while, but not everyone gets the same type of headache and some people get more than one type of headache. Migraine headaches are a specific kind of headache that cause other symptoms in addition to head pain. It is now believed that migraine is a neurological disorder (a condition that affects a person’s nervous system), they often run in families, and there are environmental factors that may be involved too. Migraine headache is not the same thing as a bad headache! People who suffer from migraine are often sensitive to light, sound, and smell. Each migraine can be different and symptoms can also vary from person to person. People with migraines have throbbing, pulsating head pain on one side or both sides of the head. Children are more likely to have headaches on both sides; older teens and adults are more likely to have headaches on one side of the head. The pain usually lasts from 4-72 hours. Aura before or during the headache; Some people see spots or colors, wavy lights, have unusual vision changes, or numbness or tingling in the fingers of one hand, lips, tongue, or lower face before or during a migraine headache. About one in four people who get migraines get auras before or during the headache. If you have symptoms of an aura and it is a new experience, talk with your health care provider. Triggers are certain changes in the environment or in the body that can make a person more likely to get a migraine. People are often affected by multiple triggers, but not everyone experiences the same thing. What can I do about triggers? In order to figure out what your triggers are, keep a headache diary. Write down when you get a migraine, how long it lasts, what makes it better, and what might have caused it (such as skipping a meal or flickering lights at a concert). You can find an example headache diary here. Share this information with your health care provider so that you can come up with some answers about what’s causing your migraines (or making them worse). Migraines affect more than 10% of people in the world. They occur in people of all ages, but often begin during the early teenage years during puberty. Why do some people have migraines and others don’t? Researchers aren’t yet completely sure what causes some people to have migraines, but it’s likely that genetics play a part. This means that if your parents or other close family members have migraines, you may be more likely to have them too. 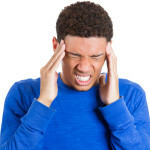 In fact, according to the Migraine Research Foundation, “about 90% of migraine sufferers have a family history of migraines.” Researchers also know that although young men get more migraines than young women before puberty, women are three times more likely than men to suffer from migraine headaches later. Although there’s no cure for migraines, the good news is that you can either work with your health care provider to prevent them from happening or treat symptoms that are bothering you. A health care provider can also prescribe medicine to take on a daily basis that can help prevent future migraines as well as medicine you can take at the beginning of a headache to help it go away. Treatment will depend on how often you get migraines, how severe the migraines are, and what other symptoms you may have. Take an over-the-counter pain medicine or the medicine that your health care provider prescribes for your headaches. There are a number of over-the-counter headache medicines, some of which specify that they are good for migraines. Make sure to take only the amount on the instructions. If that amount doesn’t help your headache, taking more is not a good idea. You may want to try a different medicine the next time you get a headache. Likewise, if your health care provider prescribes a medicine, it’s important to take it according to the directions. Rest in a dark room. Sometimes an icepack wrapped in cloth placed on the back of your neck can help. Note: It’s important NOT to take over the counter medicine (such as ibuprofen) more than twice a week. This can cause more headaches called “rebound” headaches because your body gets used to having the medication in your system. If you ever have a severe headache, changes in vision (double vision, blurry vision), a stiff neck, confusion, severe vomiting, fever/chills, headaches that wake you from sleep, or other new or concerning symptoms that occur along with a headache, call your health care provider right away, or go to the Emergency Room to get checked out.